We've just got word from Incredible Technologies that their upcoming WiiWare release Carnival King will be hitting the North American WiiWare service on Monday, November 2nd and will cost 700 Wii Points. Carnival King is an all-ages target shooting game that combines exciting 3D graphics and an enticing carnival sound track to create a fast-paced and challenging gaming experience. Players choose from three theme parks each with four distinct locales. Bonus rounds reward those who excel at speed, timing, strategy and accuracy. Competitors will be able to gauge their play against others through local leaderboards available on their Wii™ and through the Nintendo Wi-Fi Connection™ that displays the top scores shot in North America. One or two players can compete to dethrone the Carnival King. 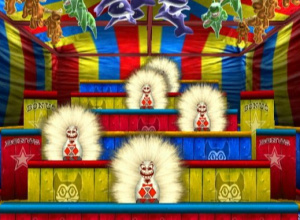 We'll have more information on Carnival King as it becomes available, as well as a full review of the game next week. To be honest, I'd rather have Cave Story. But, as far as target-shooting games go, this looks decent. I guess it would be nice if they both came out on Monday. I love shooting games, but I don't know what to make of this. I think I rather go for Wild West Guns. I think it looks really cool. I can't wait to try it out. I am looking forward to see how well this reviews. I would like something else to use my zapper for. Looks decent and nicely priced. Not so sure about the whole presentation though. Anyway... I just can't wait for Bit.Trip VOID. Hope that its a decent shooting gallery game. Its one of my favorite genres, an easy ones to do on the Wii, so I guess we'll see. any1 no if adventure rebirth comes out this monday as well? if this is "exciting 3D graphics", then uh... theres obviously something I'm missing here. Only a NL review will tell, I guess. It was on Nintendo Week on the Nintendo Channel, so it's probably going to be quality. I'd wish Cave Story would already be released. @Corbie You doing the review ? I don't know yet Devil. I guess it depends on what other games come out. To quote Syndrome, "Lame lame lame lame LAME!" We had better get Cave Story, or I'll... I'll.... I'LL! @moomoo When was it featured on Nintendo Week? Cave Story better come too. I'm tired of waiting. Shootano looks like the better lightgun game anyway. Another king of popularity??? I don't think so but, who knows??? I'm going to have to go off for a quick second. I'm tired of these type of games ,how many light gun shooters and how many mini game collections do we need on this service?? Can developers come up with a better solution? Why not try something like the developers of Bit trip or something ORIGINAL. I will not be buying this or any type of it's kind ever. Let me say this, Compared to Resident Evil Umbrella Chronicles and Dead Space:Extraction plus the Mario Party titles, these type of games on the Wiiware service look and feel watered down.It would be fine if these games had a more epic feel but sadly they don't. I do understand this is a "family" machine but doesn't anyone agree that it's getting a little crowded? Not everyone can or will buy zombie shooters. This is a fun, light wii play style shooter with a carnival theme. It was/is one of my insta-downloads. Come to EU soon please! At 700 points this may be an insta-download for me, depending on what else comes out... love playing target shooters on Wii! S'about time. Was wondering what happened to it! Oh Yay! I really hope that we get something else too. Where's Heron Steam Engine? Get this weak stuff outta here. I kinda agree. This may not be horrible, but it's not very original, and seems like kind of a quick cash in. I don't mind that there are lots of them, but they should just all be 500 points and every thing else 1000, then stuff that is amazingly polished 1500. Most of the stuff here really should be at 500 points, though, than I'd be happy to pay more for the good stuff and I'd even try way more of this crap which brings visibility to the occasional small gem at 500. I've found that in the past the two phrases "all-ages target shooting game" and "fast-paced and challenging" do not go well together. Either the game should have kiddie graphics and game play or more serious graphics and game play. I see this one looking to crappy for me to play and to difficult for my kids. I'll hope for the best and wait for the review though.